It was my first time living away from home and although London was only a 30-minute drive from St. Thomas, my hometown, my family and I thought it would be best to move into residence with everyone else so that meals were provided and I didn’t have to commute. Doing so meant that I’d be embedded more into the social life that comes with being at university. So they came with me to unload me into my dorm on Day 1 of Frosh Week. Still with my family for food before move-in began, things felt normal. I moved into Saugeen-Maitland Hall, which I’d later hear was listed on David Letterman’s Top 10 List of campus residences in North America to get laid. Later than this, I realised this list was an urban myth… my first introduction to fake news, you could say. Still, you get the gist of the atmosphere of this particular residence. Then, after moving in and meeting my roommate, he decided to move out immediately. So I became that weirdo kid who had no roommate to bond with during Frosh Week. You may think having a double room to myself would be a plus, for a shy introvert that I was, it wasn’t. Never one to have school spirit of any sort mixed in with being a bit shy and out of my element, the fact that Frosh leaders had organised a bunch of mandatory groupings by rez floor to learn chants and songs to build up enthusiasm left me feeling like I was part of an elementary school cult. To this day, I’ve never liked pep ralleys or the like. Plus, with no roommate to accompany me in these adventures, I felt very out of place. Each evening during Frosh Week, there were residence events to attend. Many of them were a bit too overwhelming, but I managed to lurk out of my room to the dance. Everyone was dancing around and writing on each other. Sure, I got some marker on me, I even kept this t-shirt in a box until many years later, but I felt like a poser. It wasn’t me. It made me question my own existence in this cultural phenomenon. Why was I the one who didn’t fit it? 8/9/93 #froshme Rez was a crazy thing to throw myself into. I wasn’t social, but I knew where my comfort zone was and it needed breaking. Perhaps as a preview of things to come, I knew that how I’d been my whole life as an introvert wasn’t going to work for too long. I had to make it through this week and put myself in uncomfortable situations and try to break out of this shell. I didn’t like high school for similar reasons, and knew that something had to change. So I forged on… school spirit and ra ra ra. Go me. The whole week without classes had been a huge wake-up call to me. I learnt more of my limitations socially. I knew what I had to work on in order to feel better about this whole university experience. I knew what it entailed. But finding and building relationships with some high school people I didn’t know that well before and going away from the residence, even for an evening, was a welcome change. It also uncovered a whole new freedom as a young adult that I hadn’t experienced before: no one to be accountable to except myself. When my new roommate finally did move in, he was energetic and outgoing–the complete opposite to me. And it was a bit too late to undo some of the damage I’d done mentally to myself from the previous week. 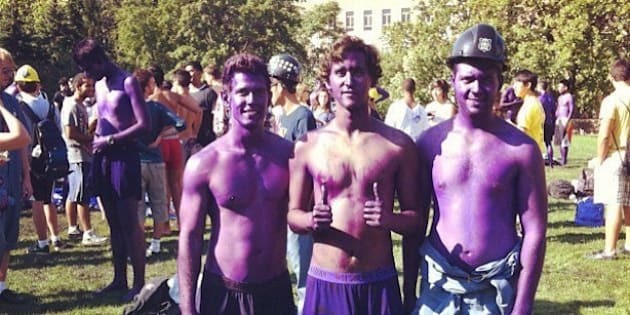 Plus: Engineer… as a Humanities student, that whole thing and its purple culture was eye-0pening. A true Humanities kid… when classes started I felt such a rush of inspiration and relief that the journey into the scholarly side of university was finally beginning. While I’d thought this past week had pushed me and I’d grown up in many ways, I had no idea that the next four years would completely change who I was, how I thought about everything, and set the course for where I’d end up. Looking back, I think I can empathise better with how some of my first-year international students may be feeling, but all of this amplified for them. Sure, some adjust quickly with the outgoing personalities that make the transition easier. Others may be a bit more like me back then. As an instructor, I’m fully prepared for classes to begin this week, but are my students? Maybe I need to give them a break in the first few weeks. How was your first week at university? 1st year, 2nd year, 3rd year, 4th year = we say these to describe our university ‘grade’, rather than the US versions, like freshman, sophomore, etc. college = not equivalent to ‘university’, but often within a university, like University of Toronto, there are individual colleges where students’ departments may be housed or where their residences may be; also, ‘college’ often refers to a different type of higher education institution where students graduate with certificates and do trade-based learning, etc. frosh week / orientation week = the week usually before classes begin where incoming first-year students kind of acclimatise to the campus… see above memory lane trip for examples. rez = on-campus residences where students stay, often involving a meal plan, etc.